An easy weeknight casserole that everyone will love. 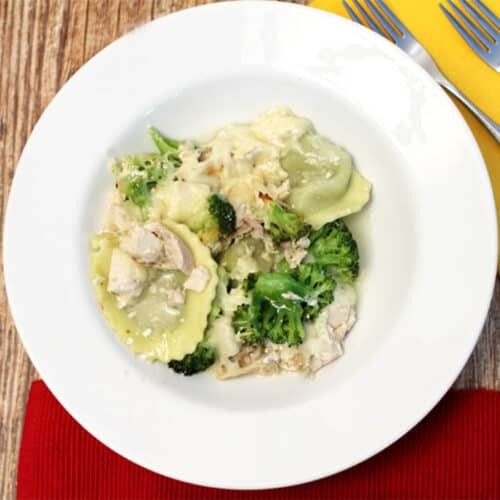 Layers of your favorite ravioli, chicken & broccoli, covered with a creamy sauce & loads of cheese. In a large skillet, saute olive oil, garlic and red pepper flakes for 2 minutes. Stir in salt, pepper, white wine and lemon juice. Cook for another 3 minutes. Remove from heat. Slowly stir in half & half so it doesn't curdle. Mix in 1/4 cup Parmesan cheese until you have a smooth sauce. Set aside. Pour a small amount of lemon wine sauce in bottom of 8x11-inch baking dish, Lay ravioli on bottom in single layer. Top with chicken, then broccoli and cover with remaining sauce. Sprinkle mozzarella cheese over all and finish with remaining Parmesan cheese. Cover with foil and bake for 30 minutes. Remove foil and continue baking for an additional 15 minutes.